Heading into the trade deadline in 2015, the Toronto Blue Jays stood six games back of first in the AL East. There were 14 deadline deals made, including the signings of LaTroy Hawkins, Ben Revere, and Mark Lowe. Obviously the biggest names to come to Toronto were David Price and Troy Tulowitzki. As soon as the Jays signed both Tulowitzki and Price, the club sold over 300,000 tickets for the rest of the season. Move forward to the 2016 campaign, the only player to remain with the club, from those trades after making an appearance in the clubs first ALCS since 1993, Tulowitzki. Price would move to Boston, Revere to Washington, Lowe to the Tigers, and Hawkins would call it quits on his career. The club would also see Mark Buehrle walk as well as 15 other members depart ways, whether through trades, free agent signings, or through being DFA’d. August 1, 2016, let’s take a look at where the club is now, and what Shapiro and Ross Atkins worked out ahead of this year’s deadline. They currently stand just half a game back of first (59-46) in the AL East, taking it over momentarily Saturday, hosting the Baltimore Orioles. They would then lose that lead, after falling in 12 innings Sunday. The front office staff went out and got Melvin Upton Jr. to help as another outfielder. They also signed Justin Smoak to a 2-year deal. Reason being for these two acquisitions primarily was for a safety net. In case Jose Bautista or Edwin Encarnacion don’t return in 2017, they now have appropriate guys to be their replacements for now. Toronto also went out and signed Jason Grilli and Joaquín Benoit. Since they have joined Toronto, they have performed just as they are supposed to, helping out the club thus far in the sixth, seventh, and eight innings. The Jays did make a couple moves on trade deadline day. The club got Francisco Liriano, sending Drew Hutchison the other way. Toronto also received two prospects in OF Harold Ramirez and C Reese McGuire. They would also send Jesse Chavez to the LA Dodgers, getting back Mike Bolsinger. Chavez was seen struggling with his consistency out of the bullpen, not able to lock down his innings when he was called upon. Bolsinger is currently pitching in Triple A, and is 1-4 with a 6.83 ERA through 6 starts. He will most likely be signed to Buffalo for now, with a potential call-up in September, if there are any injuries or to help the pen out if someone gets injured. For now, he will slot into where Hutchison was in Buffalo. Liriano will be put into the fifth rotation spot, sending Sanchez back into the bullpen. He has a 5.46 ERA, going 6-11 in 2016, but new ballparks mean new opportunities. Sending Aaron back into the pen, will help the struggles they have faced in the later end of ballgames. Considering Sanchez is 11-1 with a 2.71 ERA pitching in 139.1 innings, the club has decided to move him back to the pen. He is having himself a CY Young award winning season, yet when Ross Atkins spoke out to the media earlier today, to sum it up, he doesn’t want to take a risk. He mentioned how the transition for Sanchez from starting to the bullpen is something he is familiar with and would give the Blue Jays club an increase in their chance to reach the world series and for him to be a bigger part in that run. Once he is transitioned, he will be put into a relief role, like he was last year. They also sent 18-year-old Guadalupe Chavez to Houston, for Scott Feldman. Feldman is 5-3, with a 2.90 ERA. The good part about Feldman, he was originally in the pen in the early years of his career. This makes him a versatile player, able to pitch wherever he would be found most useful. The look around the club is they are going to head in 1 direction. Liriano had good success with Russell Martin in Pittsburgh, so for now, he will get the opportunity to turn things around and get the wins on the fifth day for the Jays. Overall, yes, Shaprio and Atkins didn’t do as much as Anthopoulous did last season, however what a lot of Jays faithful forget is that a lot of the pieces to see a world series team is still in place. The only difference is that the other four teams in the East, went out and got better pieces to appropriately help their respective clubs. Heading into the last two months of the season, it is going to be a tight race in the east, and for the Jays loyal fans, they will see a similar situation as last year. It is going to come down to the last couple weeks of the season on whether or not they will repeat at AL east champs. 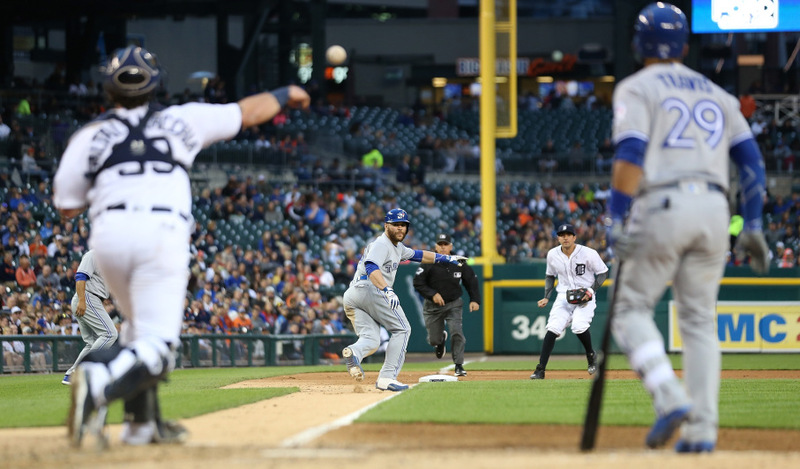 Heading into the weekday series against the Detroit Tigers, the Toronto Blue Jays were looking to continue their streak of consecutive series won. 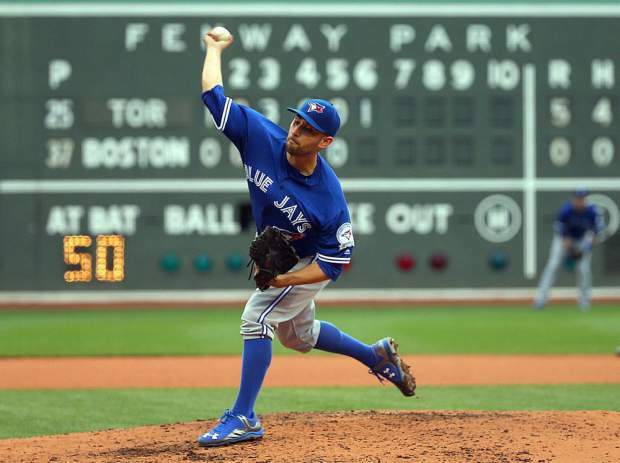 The Jays have won 5 pervious series, and on Monday, they would send J.A. Happ to the mound in hopes of starting off the three game set with a victory. The Tigers would send Michael Fulmer to the hump in attempts to get the first win on their side at Comerica Park. Things would get started off early for the Tigers ad they managed to score four runs in the bottom of the second inning, as James McCann would get the ball rolling. After Nick Castellanos and Justin Upton got on base, McCann would homer on a 1-2 count. Followed shortly after, Ian Kinsler would single to left, then move to second on a balk by Happ. After a passed ball, which would move him to third, Happ would throw a wild pitch scoring Kinsler. After just five innings of work and six earned runs batted in, Happ would be pulled in relief of Gavin Floyd. Floyd would let in three runs of his own in the sixth, and in the eighth, Storen would allow two, making Monday night’s game a blowout one for the Jays, as the blue birds would lose 11-0. On Tuesday, and in this second game of the series, the Jays would look to rebound as they would look upon Aaron Sánchez to have another stellar performance and be in search of his sixth win of the year. Facing off against the Jays on the hill would be former Blue Jay, Matt Boyd. It was a much smaller affair of hits for the Tigers as the Jays would score first, but not until the fifth. The earned run would be brought upon center fielder Kevin Pillar. Looking ahead to the seventh inning, Pillar would be the help they needed once again, as he would score the second run off a fielder’s choice. Just three batters away from a win, Roberto Osuna would come in as relief, and would find himself in a bit of trouble as he would allow the Tigers to score a couple of runs, tying the game that would send this one into extras. In the tenth, Joe Biagini would give up a single to Justin Upton, and after a single to left, Upton would score, taking game two of the series, and just one game away from a sweep. Throughout the game though, the story wasn’t the runs or the lack of, but it would be on the Jays Sánchez. In just his tenth pitching performance of the 2016 year, the young right hander would see himself going 8IP, giving up only 2ER, walking 1, and striking out a season high 12. The Jays would now find themselves staring a sweep down the tunnel. R.A. Dickey would be the man the Jays would be looking at to shut down the tigers and salvage a win before heading home to face off against the Baltimore Orioles. Jordan Zimmerman would be the man for the Tigers, as he had hopes of helping his team get a sweep. Both clubs would score a pair of runs to start off the game. Justin Smoak and Nick Castellanos would both hit home runs respectively, helping their clubs. Entering the third inning, the bats would start to come alive for the Blue Jays as Josh Donaldson would hit a three run home run scoring Josh Thole and Jose Bautista, now making it a 5-2 ballgame. Two more runs would score in the top of the fifth, and that’s all that would take place as the Jays would salvage their much needed win. Dickey would wind up going 5.1IP, giving up only 2ER while Zimmerman went 4.2IP giving up all 7ER. The Blue Jays 32-39 will now head back home to Toronto to get ready for a four game match-up against the Orioles. 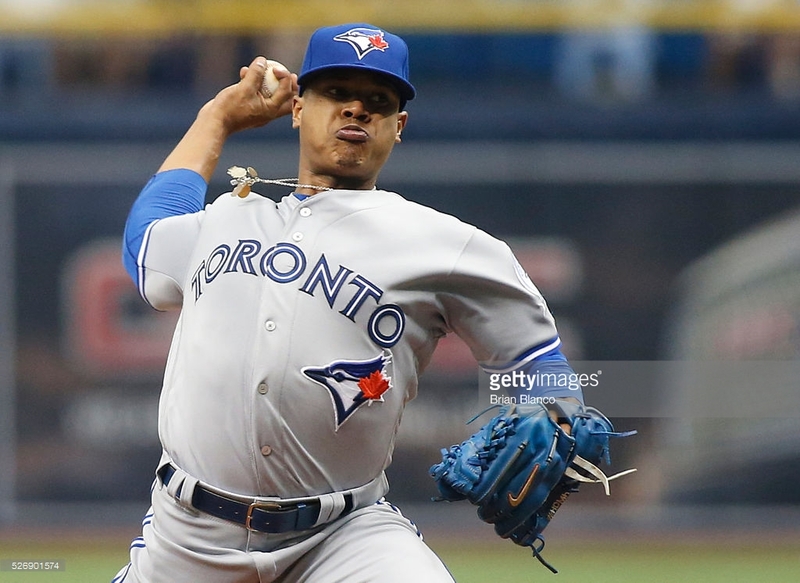 Marcus Stroman (5-2) will start Thursday evening as his counterpart will be Tyler Wilson (2-5). The home town club of Toronto will look to continue their winning streak and get back on pace to winning series. The Blue Jays would fly into Tropicana Field for a mini three game series this past weekend. Aaron Sanchez would be sent to the bump for the Jays, as he would be looking for another strong start. The Rays would send Drew Smyly for this matchup. The Jays would be looking to put an end to their three game losing streak in a needed win ahead of their upcoming homestead versus a familiar opponent, the Texas Rangers. Things would remain quiet for the most part of the game. Thanks to a couple of home runs from Michael Saunders and the MVP Josh Donaldson, the Jays would go up 2-0, heading into the eighth inning. The pace of the game would start to pick up, but not for the home team of Florida. The Jays would score three runs, as Michael Saunders would homer for a second time Friday evening, before Donaldson and Bautista would both score a pair of runs as well. The Rays would manage to score one run on the board, but would ultimately fall 6-1 to the blue birds. Heading into Saturday’s game, J.A. Happ would look to continue the momentum. Toronto would score two runs early thanks to Jose Bautista. He would take one deep, scoring himself as well as Josh Donaldson. The Rays would respond, as Logan Forsythe would make a line drive to Kevin Pillar in center, scoring Kevin Kiermaier. J.A. 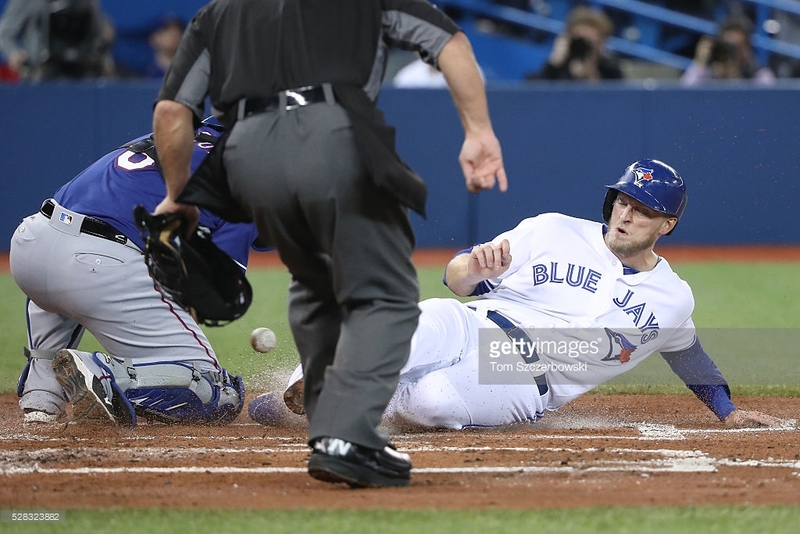 Happ would pitch through 6.2 innings, allowing Tampa to score three runs, and the Jays would not be able to respond scoring only an additional run in the seventh, getting three runs in over three hits. Tampa would tie the series up, at one a piece. Marcus Stroman turned 25 on Sunday. He would be looking to celebrate the birthday with a win, to get momentum back for his team closing out the series, before facing Texas on Monday. It would be an exchange of runs early for both clubs as it would be tied 1-1 until the fourth. The gates would open up as the Jays would rally four runs in, to help Stroman not only give him the W on his birthday, but give him his fourth win of the season. To start the ninth, Xavier Cedeno would replace Erasmo Ramirez who would give up a double to Darwin Barney, and walk Michael Saunders. 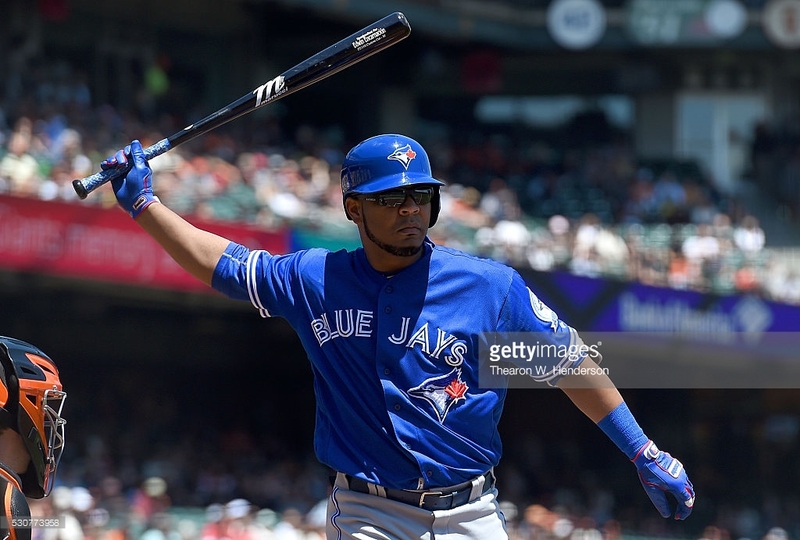 Alex Colome would then come in and after striking out Bautista, and making Encarnacion ground out, Troy Tulowitzki would homer scoring Saunders, Donaldson, and himself. The Rays would try to fight back, but Roberto Osuna would come in to do what he does best, close out the game. He would replace Stroman who went eight innings. 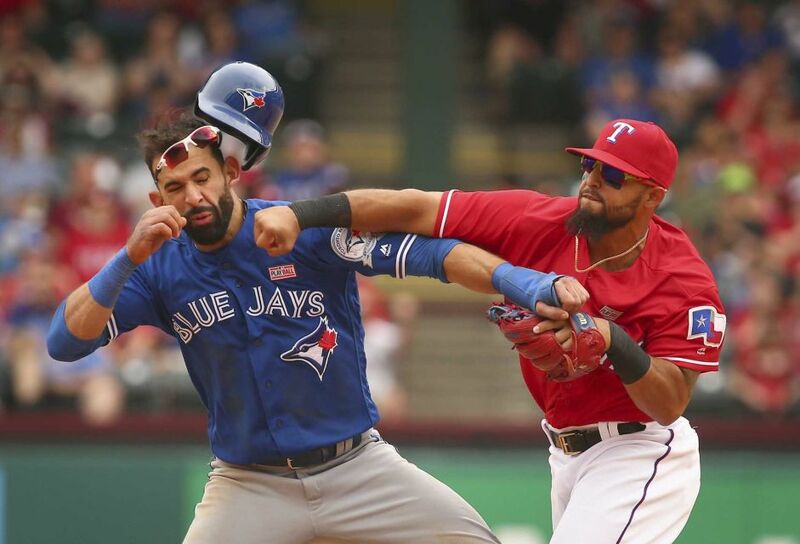 The Jays will now fly home for a weeklong stand, facing off against a familiar foe in Texas Rangers who they last saw during the ALDS Championship Series, last year. R.A. Dickey will be sent to the mound, as Texas responds with A.J. Griffin. Griffin looking for his fourth win, as Dickey will be looking to prevent that and work towards his second win of the season.